Three models of IFF dipole antenna with a balun which is covered with dielectric radome and mounted on the F-16 aircraft fuselage were simulated using WIPL-D software. The first model is without any reduction applied, while the other two models use antenna placement reduction and later shadow. All simulations of this complex antenna placement scenario are performed very fast. The matrix inversion was speed up by using inexpensive GPU cards. The results shown demonstrate that WIPL-D can successfully simulate electrically large platforms (approximately 105 wavelengths length) with dielectric involved. The simulation is fast and accurate despite having 105 wavelengths aircraft and electrically small feeder area. The diameter of inner coaxial conductor of antenna feeder is only 3.16 mm (approximately 45 times smaller than wavelength). Properly applied reductions yield preserved accuracy but the simulation time is significantly reduced. This allows simulation of return loss in wide frequency band, with low number of frequency points owing to built-in interpolation. Anti-collision system (or collision avoidance system) is a safety system found in cars which detects danger and reduces possibility or severity of collision. In this application note, we consider anti-collision system which uses radar at 77 GHz mounted on a car bumper. The simulations will be performed using Domain Decomposition Solver (DDS), WIPL-D product dedicated to simulating electrically very large problems. The anti-collision radar is modeled by using 4×4 patch array. The model of the bumper was imported to WIPL-D Pro CAD and the patch array has been added to emulate a real world antenna placement scenario. All of the simulations have been performed on a powerful desktop machine with two 12-core CPUs and significant amount of RAM. All simulation times are under 1h in the DDS. WIPL-D Software suite encompasses several simulation techniques, with emphasize on accuracy. The default is a frequency-domain Method of Moments (MoM) code. The simulation of real life platforms (aircraft, ships, cars etc.) at RF frequencies is possible based on modern and affordable GPU technology. A common engineering problem is the coupling between antennas on large realistic platforms (the same or different frequency band), located in different positions. A feature to automatically reduce order of current expansion on parts of the model insignificant for EM results is smart simulation: shadow or the antenna placement reduction. The application note uses the fighter aircraft F35. It is 15.7 m long (wing span 12.3 m), that makes it 78.5 wavelengths electrically long at 1.5 GHz. Simulation requires around 92,000 unknowns without any reduction. Owing to application of numerous sophisticated techniques, very large structures are simulated on regular desktop PCs (here quad core CPU with 1 GPU yields simulation times under 1h). Number of unknowns generally rises as the square of frequency. WIPL-D offers solution in WIPL-D Domain Decomposition Solver. 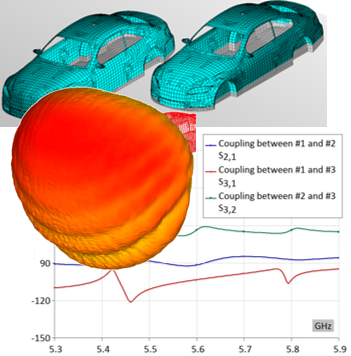 EM simulations have a significant role in automotive industry. One of the most demanding problems is vehicle to vehicle communication, as well as general interaction of the vehicles with the environment. The main applications are toll and safety systems, as well as auto pilot and parking sensors systems. One of the arising frequency bands is 5.9 GHz. The application note first shows placing 3 short monopole antennas to generic car model. Such simulation is run by MoM on a powerful desktop with two 12-core CPUs and four low-end GPU cards. In the advanced scenario simulation involves two cars. The problem was first analyzed by MoM and then by the DDS solver. The basic scenario is solve din minutes. The advanced scenario includes 2 vehicles and 6 antennas in total. No symmetry can be applied so total number of unknowns is 364,262. Simulation time in MoM is in hours, while the DDS solver runs the problem in under 30 minutes. The results include antenna radiation patterns, as well as antenna return loss and coupling. This application note presents WIPL‑D simulations of two electrically large scenarios. 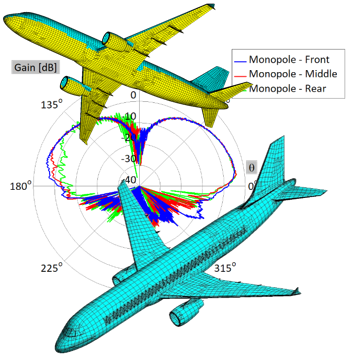 The first scenario encompassed a monopole antenna mounted on the model of the Airbus A320 (simulated at 833 MHz). 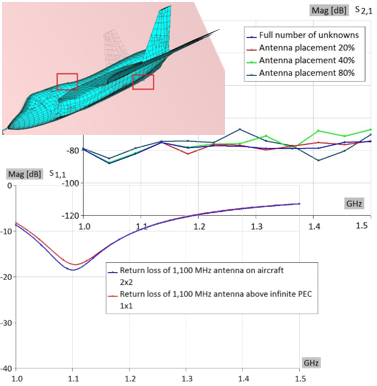 The second scenario encompassed three monopole antennas mounted in three different positions on the aircraft (simulated at 1.53 GHz). Results show WIPL-D capabilities in antenna placement problems. Converting CAD format files to WIPL-D Pro native format is done easily through WIPL-D pro CAD. Antenna placement reduction or Unused Entities can tremendously decrease required computational resources without compromising accuracy. Beside very efficient CPU simulation, the benefits of using GPU Solver are needed for 200 lambda aircraft. 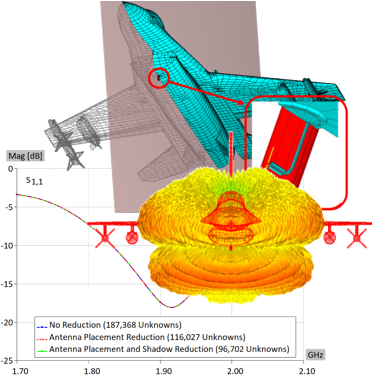 Such EM simulations enable antenna engineers to experiment with various antenna models in various environments. The influence of the surrounding objects to an antenna can be easily tested. Here the influence of the wings and the tail on the radiation pattern is shown. Near field results of indoor Wi-Fi antenna after simulating the models at 2.4 GHz are presented. The Wi-Fi antenna itself is positioned inside the room with brick walls. In addition, near field results for the model of the antenna in free space at 2.4 GHz are also presented. The near field distribution inside of the room is plotted in 501×501 points. All the simulations are performed using WIPL-D software suite. 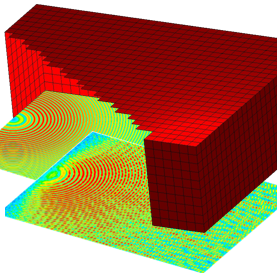 After applying optimal meshing parameters, the model of a Wi-Fi antenna at 2.4 GHz was first simulated without any reduction. The second simulation of the indoor Wi-Fi antenna was performed with smart reduction applied. The Wi-Fi antenna is positioned in such a manner that two symmetry planes can be used. Computer used for these simulations is a regular PC equipped with a GPU card which is used in method-of-moments (MoM) matrix inversion. The simulation time for all scenarios is acceptable from engineering point of view. With smart reduction applied, the number of unknowns in simulated scenarios decreases around 2 times (the computer memory requirement decreases around 4 times), while the simulation time decreases around 9 times. The time saving feature comes without noticeable changes in values of the calculated near field. Furthermore, all antenna simulations yield theoretically expected results. When compared with free space results, it is clear that the results obtained for the WI-Fi antenna located within a room show the reflections from the walls. 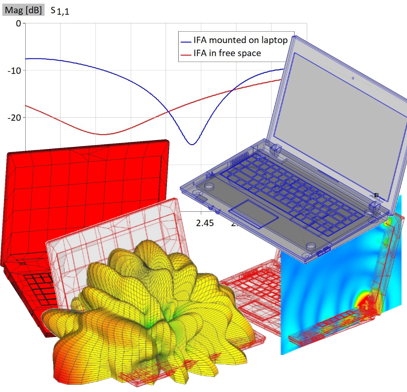 EM simulations of laptop and mobile devices have gained popularity in the recent years mostly due to of expanding abilities of modern simulation software and hardware. Laptops or mobile devices are usually developed through a relatively complex process with an antenna coming into play in the final design phases. Accordingly, the modeling of a laptop antenna typically starts with an import of the laptop geometry created in third-party software into EM model editor. Typically, an imported model has huge number of details irrelevant for EM simulation, and may in addition contain a number of geometry irregularities. The example presented in this application note elaborates how WIPL-D Pro CAD is used for EM simulation of antenna placement of inverted F antenna operating at 2.4 GHz mounted on a laptop. 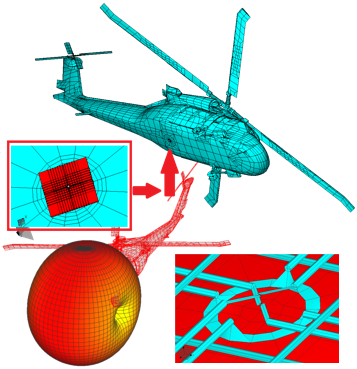 The steps required in the preparation of an imported model for EM simulation are explained. High efficiency of WIPL-D software suite for modeling and EM simulation of complex geometries at RF frequencies has been demonstrated. 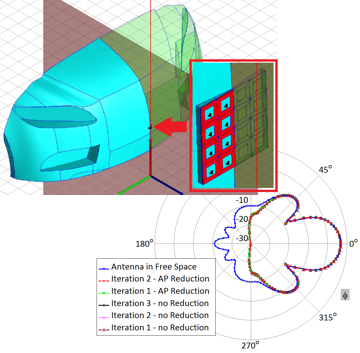 Although laptop model comprises many details and fine features, simulation model has only 3,500 mesh elements as WIPL-D quad meshing algorithm yields models optimal for EM simulation. Simulation time when using regular desktop PC enhanced with inexpensive GPU card is measured in minutes. WIPL-D Pro is well-known full wave 3D EM Solver, based on MoM and empowered with quadrilateral mash and high-order basis functions (HOBFs). A unique combination of HOBFs and MoM allows us to accurately simulate electrically large models. WIPL-D offers very efficient CPU and GPU simulation on inexpensive hardware platforms. Magnetic antenna system, patented by G. Wennerberg, is efficiently used as direction finding antenna. MoM codes have been often challenged when the simulated device is electrically small. In this application note, the state-of-the-art MoM code is used for electrically small structure efficiently, with extremely accurate and fast simulation. The results include radiation pattern of ADF in two scenarios (in free space and the ADF antenna mounted to the real-life model of a helicopter) at two frequencies: 190 kHz and 535 kHz. Here, WIPL-0 Pro is used for low frequency simulations which are not usually the default application of MoM (owing to the special techniques for treatment of low frequency problems). No expensive hardware is necessary (at regular desktop PC or laptop, the simulation time is measured in minutes). One of typical applications of EM tools in automotive radar industry would be accurate prediction of radiation pattern of automotive radar antenna mounted on the front part of a car. Also, near field distribution in front of the car shell (usually in presence of obstacles) is extremely important. This application note shows DDS capabilities since the frequency in question is 77 GHz. The anti-collision radar is modeled by 4×4 patch array which is mounted on the front part of the car shell. The EM simulations were performed powerful desktop with 2 12-core CPUs and significant amount of RAM. After the convergence study, it was concluded that the first DDS iteration enables excellent accuracy. 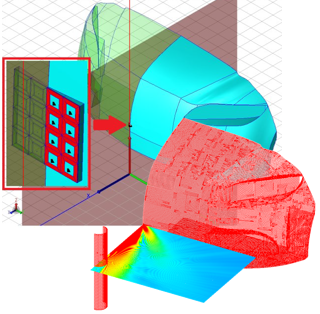 The simulation results provide deep insight via radiation pattern or the near field of the obstacle influence to the antenna mounted to car bumper. All simulation are carried in under 1h.